This versatile little tree requires a little thought and care if its introduction to a property is to be a success. It is not ideal for all sites and climate conditions and it is vulnerable to a range of diseases and insect predators. 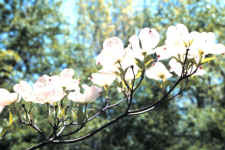 The flowering dogwood is also easily damaged by lawnmowers and doesn't respond well to rough handling. Perhaps most importantly, however, the quality and composition of soil will determine the health of your flowering dogwood tree. Best suited to nutrient-rich forest soils, it often becomes stressed when planted in relatively poor urban soil. You can help your tree by adding mycorrhizal fungi, fertilizers and biostimulants to the soil. Taken together, these treatments will put the right nutrients in the ground and give your tree the tools to take better advantage of them.